Living Blues #256 (August/September 2018) takes a look at protest in the blues. There have been songs of protest throughout the history of the blues and in this issue we trace a sampling of the voices of dissent over the decades and then turn our gaze to several contemporary musicians and their strong voices of dissent. Rhiannon Giddens, a founding member of the Carolina Chocolate Drops, has branched out on a soaring solo career that finds her taking on challenging subjects from America’s past and present. Winner of the 2017 GRAMMY for Best Contemporary Blues Album, Fantastic Negrito has roared onto the scene with a voice and attack that takes on a wide range of nationally relevant issues.Colorado native Otis Taylor has been challenging the power structure in America since the 1970s and his focus has only steadied as he has aged.Reverend Osagyefo Uhuru Sekou, who hails from the Arkansas Delta, has a message of peaceful protest that is international. A musician who is also a human rights activist, Sekou practices what he sings. This issue also includes the winners of the 25thannual Living BluesAwards, Breaking Out with Reggie Garrett, the latest blues news, over 40 reviews and much more. 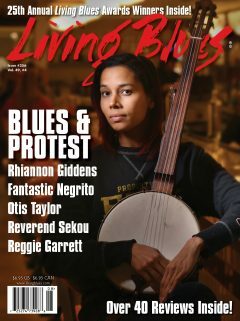 Digital and print subscriptions to Living Bluesstart at just $18.00 and are available at www.livingblues.com.